It’s coming up to the Christmas and new year period, and nominations have opened for the Edublog Awards 2015. The last few years I have written a post to nominate some of the blogs I enjoy most, and here I will list my nominations for this year. I hope you check out the blogs and find some that you enjoy as much as I do. Always a tricky one, especially as blogs that are new toe aren’t always new! 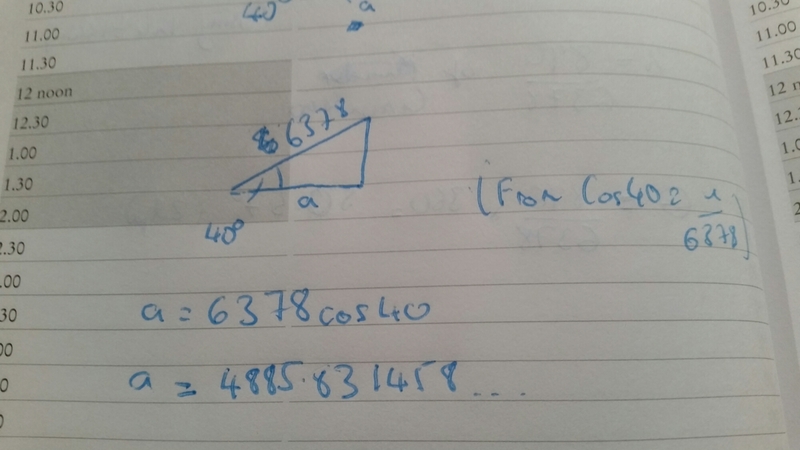 My favourite of the genuine new blogs I have discovered is Andy Lyons (@mrlyonsmaths) “Mr Lyons Maths” blog. It’s a lovely mix of resource based posts, pedagogy and policy. And Andy is always up for debating the issues he posts about. This is a tough category, there are a lot of interesting group blogs. The fledgling “Better Questions” blog is certainly showing a lot of promise, but the one I enjoy reading, and writing for, the most is “Labour teachers“. Curated by Andrew Smith (@oldandrewuk)it is a great blog that takes opinion from all sections of the Labour movement. There have been some excellent debates on there and views are certainly not censored to a “company line”. There are so, so many excellent resource sharing blogs out there that it is really difficult to narrow this down to a single nomination. Some great ones I’ve used this year’s include “Just Maths“, “Solve my maths“, “Pret Homework“, “Median“, “Miss Brookes maths” and “Mr Barton“. There are many others too. But this year’s nomination goes the same way as last year: “Resourceaholic“, the blog of Jo Morgan (@mathsjem) who shares some awesome resources as well as some great reflections on teaching and learning. My favourite section of her blog has to be the Maths Gems series where she shares ideas she’s picked up over the week. A bizarre category really, as the vast majority of Edublogs are written by teachers. There are so many to chose from too. 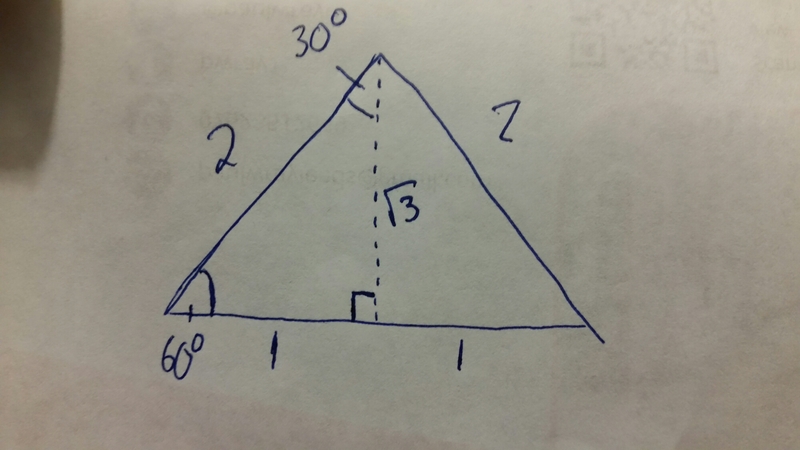 This time I’ve selected Ed Southall’s (@solvemymaths) “Solve my maths” in this category. It’s a great blog that has some excellent teaching ideas from an expert teacher and teacher trainer. This is one that is very difficult, there are some great headteacher blogs out there, two in particular were hard to decide between. John Tomsett’s (@johntomsett)superb blog, and Tom Sherrington’s (@headguruteacher) fantastic “Headguruteacher“. Both are well worth a read if you have a spare few minutes. This category is one that in recent years I’ve selected the post that inspired me the most. Normally something about teaching or schools, but this year I’ve picked something a little different. I’ve picked this post from relatively new edublogger Luke Blackburn (@MrBlackburn77) entitled “Rossett school politics enrichment trip to the Houses of Parliament”. It’s a post which highlights some great work being done by Rossett school around citizenship. Every week 30 students from across all year groups at Rossett give up a lunchtime to talk politics, that is no mean feat in the apathetic age we live in and this post charts the politics club on their annual trip to the houses of parliament. I think it’s great that parliament offer this and I think it’s great that schools take them up on it. I feel citizenship education is of paramount importance and I look forward to reading more about this politics club in 2016. I interact with so many people.overbthe medium of twitter hat it’s hard to.narrow down, but I think this year I’d like to nominate Tom Bennison (@DrBennison) in this category, as he has had some great ideas, sent me some superb links and crated #mathsjournalclub, which is my favourite of all twitter hashtag chats. This is another category I have real difficulty with. There’s so.many amazing blogs out there its almost impossible to decide. Colin Beveridge’s (@icecolbeveridge) “Flying Colours Maths” has been brilliant for another year along with those mentioned above and many many more, but I think this year I’m going to nominate Ben Orlin’s (@benorlin) “Math with bad drawings“, it’s a blog that regularly makes me think,while at the same time has me rolling on the floor with laughter! Go check it out. There are, of course, many many other blogs and pages I like and you can see a fuller list here, which I endeavour to update as often as possible. There are plenty more blogs and pages I like, you can find some of them here. I’ve been thinking a lot this week about understanding. There are different levels of understanding, there’s the deeper understanding (often referred to as Conceptual understand or relational understanding), then there’s a surface level understand (usually called instrumental understanding). The deeper understanding implies that someone understands why things are happening and a surface understanding implies that someone understands what to do in a given situation. This paper by Skemp (1976) is excellent on this topic. A simple example might be if you have a student a simple equation: 3x + 1 = 10 . I’d the student is working with a surface understanding they may be able to solve it because they recognise that you “undo” the terms to find x. While a student with a deeper understanding would understand the role of the = sign and know why the inverse operations work. 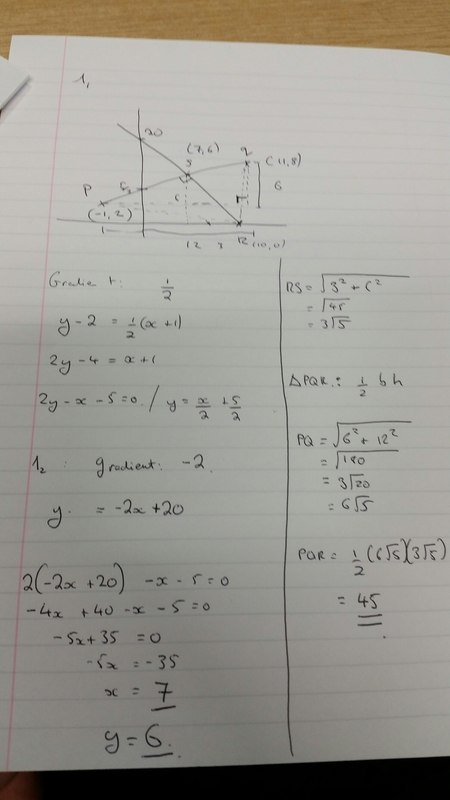 As far as mathematical knowledge goes, a deeper understanding is far preferable to a surface understanding, but as far as passing a GCSE exam goes both of these levels of understanding will yield the exact same results, and as the surface understanding is quicker and easier to achieve a lot of teachers focus on this method to get their students their target grade or above. For many this is down to the pressures crated by the system of league tables and Ofsted gradings that drives a lot of the people involved in this profession. This is one of the problems with the system we currently have, and certainly suggests to me that many people have the wrong focus. Education should be about educating, not just teaching students to algorithmic answer questions that come up on a paper. 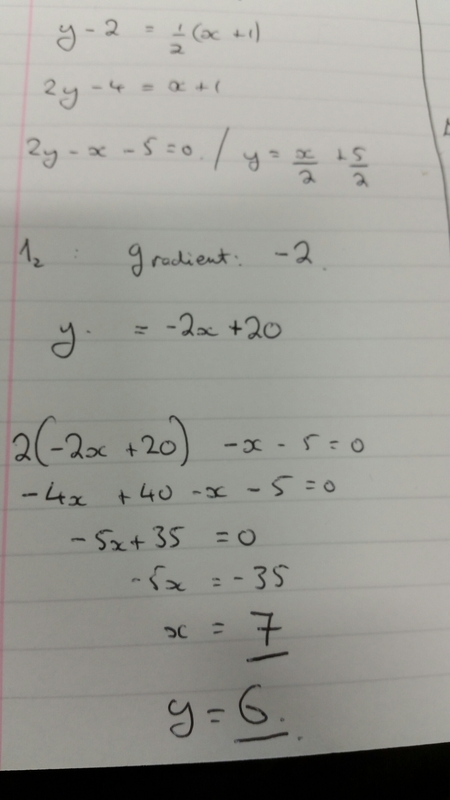 The current GCSE is set up in a way that you can get a B, or even an A, with poor algebra and trig skills if you are excellent at the statistics side of it and have memorised enough algorithms for the algebra, this means many with these grade struggle immensely when they attempt mathematics A level as they don’t have the pre requisite ability. The new GCSE spec will go some way towards combating that, but the focus on instrumental understanding to achieve the grades will mean that students are unable to make the links between topics and are unable fully grasp the follow on concepts as they haven’t fully understood the basic ones, and through no fault of their own. This week I spoke to a head of maths from another part of the country and he was talking about how he’d improved his schools results by 25% at GCSE A*-C by introducing a scheme of work that focused on the big mark questions and a pedagogy that made the algebra easy- when he described said pedagogy it was purely algorithm based and promoted no deeper understanding. He was at a point where he could not understand why his AS results were poor, despite the cohort having strong GCSE grades. It’s a situation I’ve been in and seen before. The grades are a reflection of what questions they can answer, not what mathematical concepts they understand. 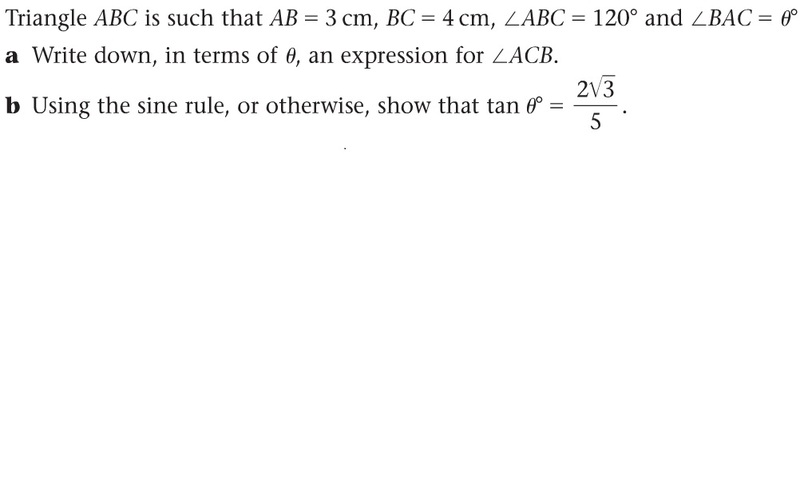 I spoke to another teacher this week from a different school in a different area of the country, and she had found that her students all got part b this C3 question wrong last year. She had completed her question level analysis and decided that it was due to the students not being able to recall the rules involved and had set about creating mnemonics to help them. I disagree with her analysis. I think the inability to answer this question comes from only having an instrumental understanding of the concepts. 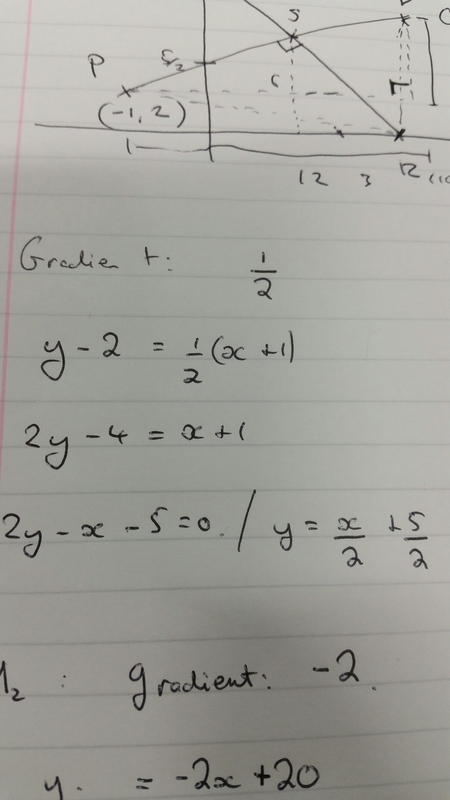 If you understand that the range of a function is the “y” values it produces, that the nature of a turning point means it’s gradient is 0, and that the derivative of a function at a point gives the gradient of a tangent at that point then this is an easy 6 marks. 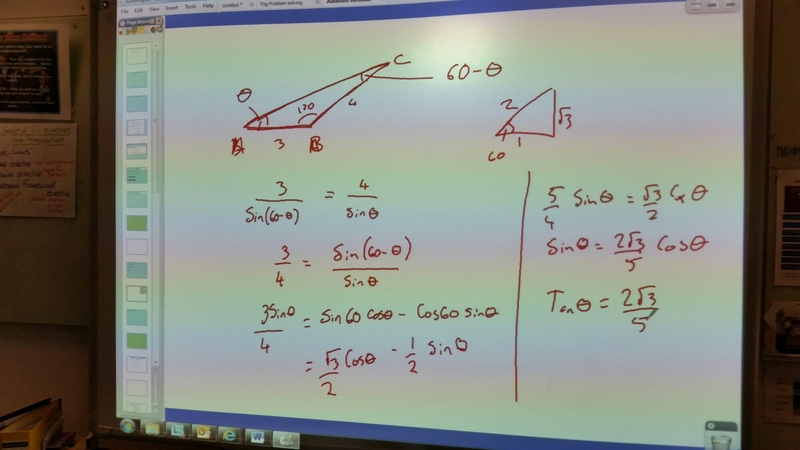 Once you know the reciprocal trigonometric ratios then the rest fall out from there. I’ve seen A level students able to differentiate and integrate perfectly, but not be able to find the area under a curve or the gradient of a curve because they’ve never been told what these algorithms they are performing do. I feel we need to move away from this, we need to encourage a deeper understanding or we are setting out students up to fail in the future. What are your views on this? I’d love to hear them. If also be interested to hear if this is a problem in other subjects or just maths. I’d imagine that it does occur elsewhere, but I’d love to hear confirm2 (or otherwise) of that, and specific examples of where it occurs if it does. Skemp, R. R. (1976). Relational understanding and instrumental understanding. Mathematics Teaching available here. This post was originally published here, on Labour Teachers on 22nd November 2015. I watched with jealousy yesterday as my twitter timeline filled with tweets that included #Michaela. For those unaware, the hashtag was related to an event at Michaela school where educationalist and teachers were debating big issues in education. It was an event I’d have loved to be at. All the debates were quite interesting but the one that has me thinking the most was the one around the abolition of Ofsted. This is an issue I’ve seen discussed many times, (including in the green party manifesto) and I can see where arguments on both sides come from. So much so, in fact, that I actually feel the debate is being framed wrong. This is a strong theme used by all who argue against abolition. And it is certainly one that I’d full of merit. But I don’t think it stands up in the debate. I would seriously worry if we had schools which were unregulated and entirely left to their own devices, but that doesn’t mean I agree with the current model. 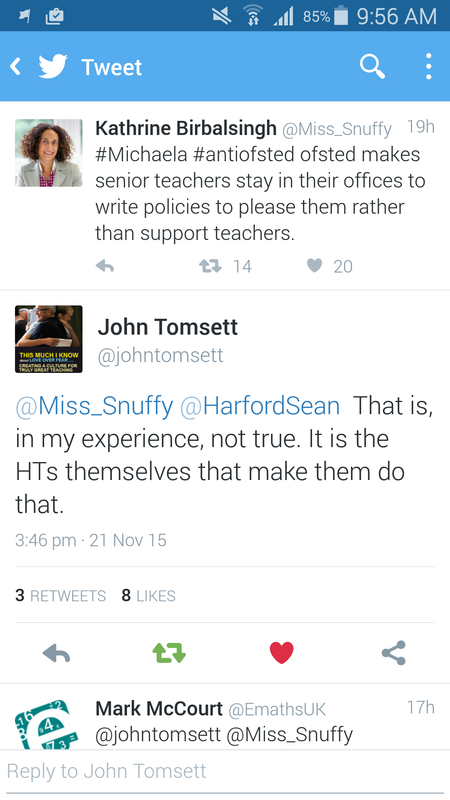 Katherine Birbalsingh (@Miss_Snuffy) was tweeting out what many perceive to be true, but as John (@johntomsett) replied, it’s not true. We’ve seen time and time again that Ofsted have spoken out against many of the practices that go on in their name (see the recent pens debacle here and here, my hatred for the word “Outstanding“, this response to a guardian secret teacher and these misguided schools), so it’s wrong to keep using it to argue against them. So what is your problem with Ofsted? It’s the culture it engenders. The 1-4 grading system is for me, ridiculous. It seems to attempt to boil down how good a school is into a tick box exercise. It doesn’t account for the complexities each school has, it promotes game playing and encourages teaching to the test, rather than for understanding. It means certain groups of children are deemed more important because they fall around a threshold grade and they receive more help, more money, more time and more resources and that is not fair. So what would you replace it with? I feel all schools can improve, and the reports should be constructive and developmental, highlighting the strengths each school has and areas in which they need to improve. This could lead to greater collaboration between schools as the all try to help each other move forward. Those schools deemed to need urgent help shouldn’t be stigmatised in the way schools in special measures can be. They should receive help to get them back on track. No school has made a concious decision to fail it’s students, some have just lost their way. We should all be working together, with a common goal of giving all young people the best possible start. And the regulatory body should be enabling that, not ranking schools in accordance to some criteria that doesn’t even take the full picture into account. This post is cross – published and can be seen on Betterqs here. I’ve written before about textbooks, they can be troublesome if used incorrectly but they can also provide a good amount of questions to allow students to get their teeth into without having a ridiculously high photocopying budget. A good textbook, in my opinion, is one with great questions covering a range of difficulties to allow stretch and differentiation when used properly. Once I’d railed at them about the importance of sketching they agreed that would be the best place to start. I made them sketch the triangle on mini whiteboards first to ensure they could then I sketched it in the board. They worked out the angle to be 60 minus theta and came up with the sine rule the selves, and then it was just a case of simplifying with the addition formulae. This question doesn’t involve any overly taxing mathematics, but it does mix the skill being learned in with prior knowledge and as such serves to enhance the relational understanding of the students. They can see where the links are and they can build those links themselves. I think that this is a superb question and we need to be using questions like this regularly to build that relational understanding, helping our learners become mathematicians, and not just maths exam taking machines. A lovely set of questions that I thought I’d run through here. I hope you’ve had a go at them before you read on…. 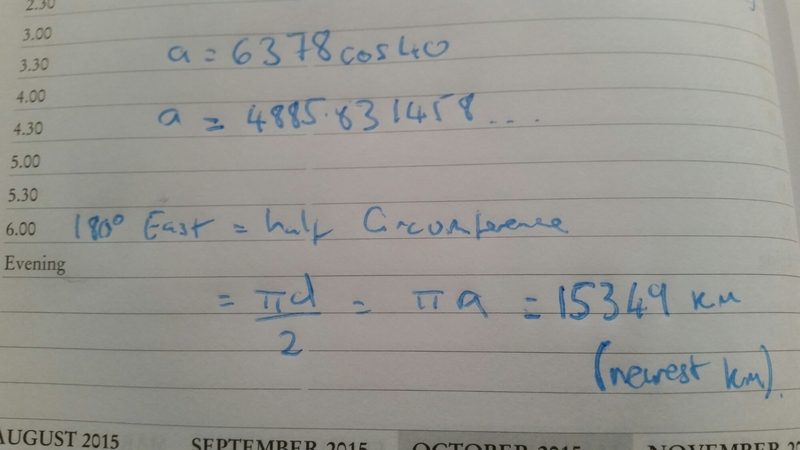 The first one appeared at first to be a very simple question, just looking at the proportion of the circumference you have travelled. I then noticed the sleight of hand with the units and realised it involved an extra step. Still relatively straightforward though. 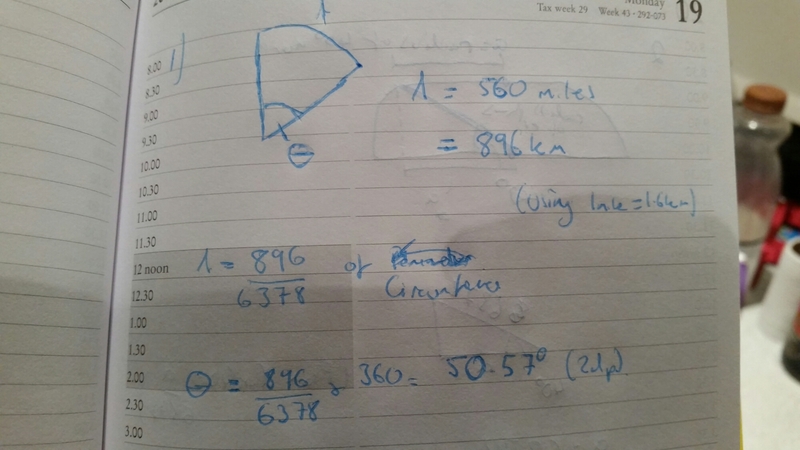 Convert the distance from miles to km and work out the proportion of the circumference you have travelled. Multiply that by 36o and you have your angle, in this case 50.57 degrees to 2dp. The second question is more tricky. 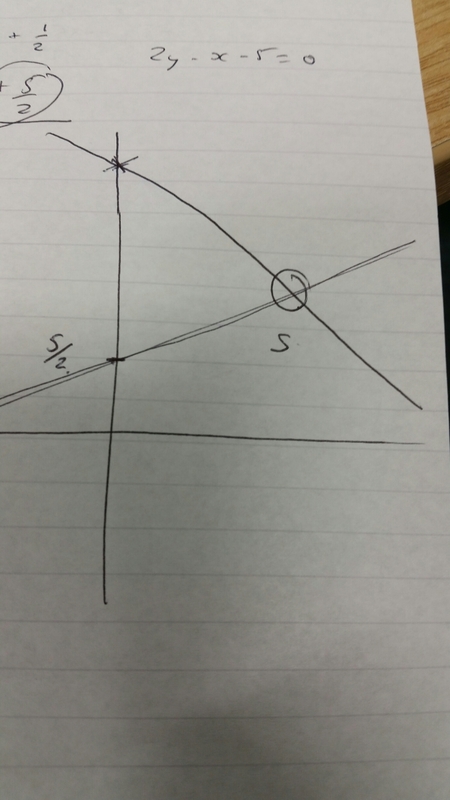 The first thing we need to work out is the radius of the circle we would get if we cut a cross section parallel to the equator 30 degrees north. In order to do this I drew a diagram (always imperative! ). 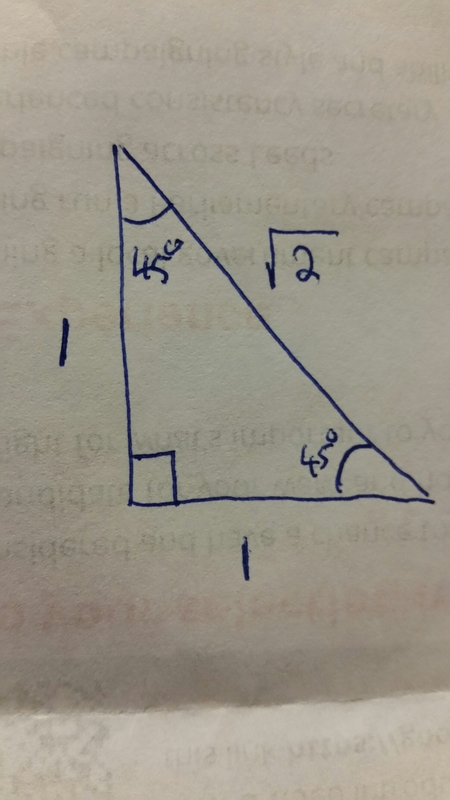 This allowed me to find a right angled triangle with the hypotenuse being the radius of the earth. 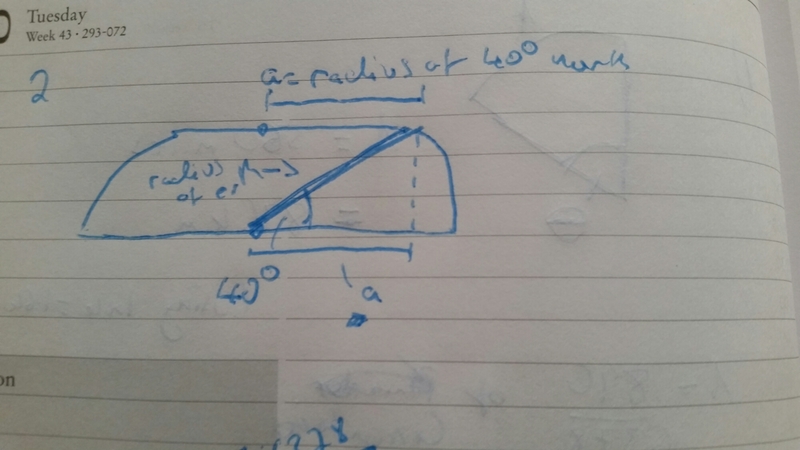 This allowed me to find the radius of the circle I was after. Once I had this I could work out the distance travelled easy enough, as we have travelled 180 degrees so half the circumference. Or 15349 km (to the nearest km.) Here I’m assuming we want the distance we have travelled around the earth, rather than the displacement which would obviously be the diameter of the cross section or 9772km. I wrote a while ago about how important diagrams can be using this Chessboard puzzle as an example. 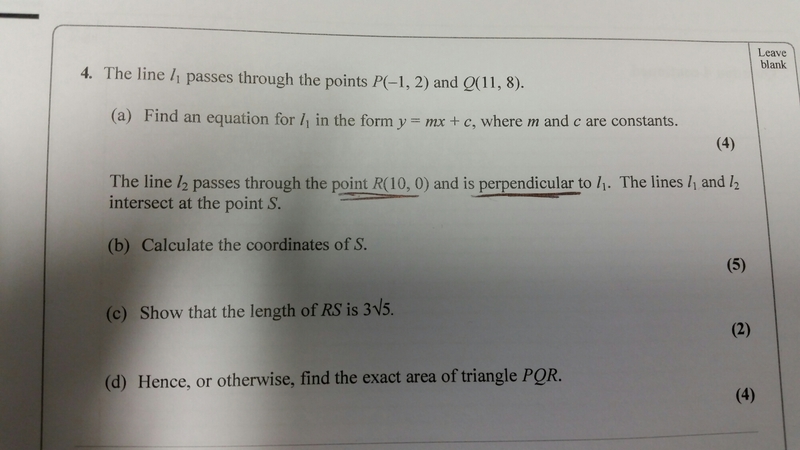 Last week I happened across another example while helping a year 12 student complete some exam questions on coordinate geometry. 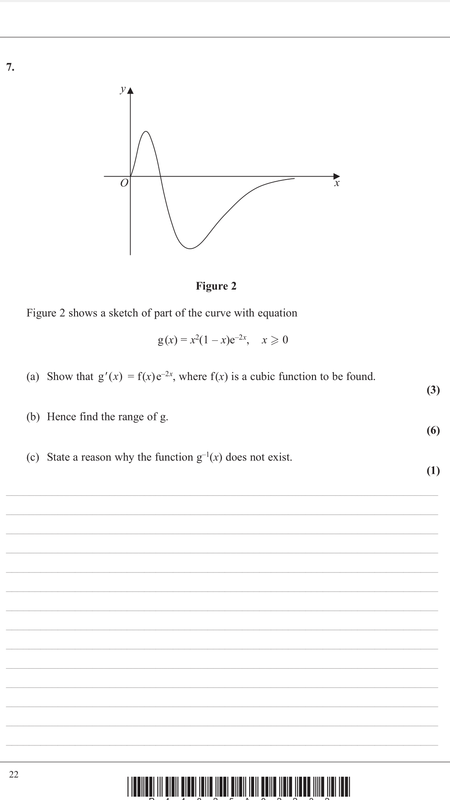 A relatively easy past paper question, but one that is quite fun nontheless. The student had completed a correctly and got the correct equation for l2 in part b but had gone wrong finding the point of intersection. She hadn’t noticed and hence had lost all the rest of the marks. Had she sketched the lines out she would have known that the point of intersection was clearly in the first quadrant and couldn’t have had a negative x value. This self checking mechanism is just one of the any reasons I try to get my students to sketch everything. I don’t understand their reluctance to do it, it makes the questions so much simpler and allows you to spot your mistakes. I’ll just have to keep highlighting these examples to them and trying to get them to see how foolish it is to avoid the sketching. Have you any ideas of how to instill the knowledge that a sketch is majorly important? If so, I’d love to hear them. Incidentally, here’s the rest of my solution.